China has long been known for the variety of traditional arts and crafts produced from the country’s many regions. The Chinese were the inventors of porcelain, with the world still referring to fine quality porcelain as “china.” The country is also known for its jade carving, its brush and ink paintings, its pottery, its luxurious silk fabrics and exquisite and delicate embroidery. Speaking of embroidery, China has different schools and regions that produce different types of skilled craftsmanship in embroidery techniques. 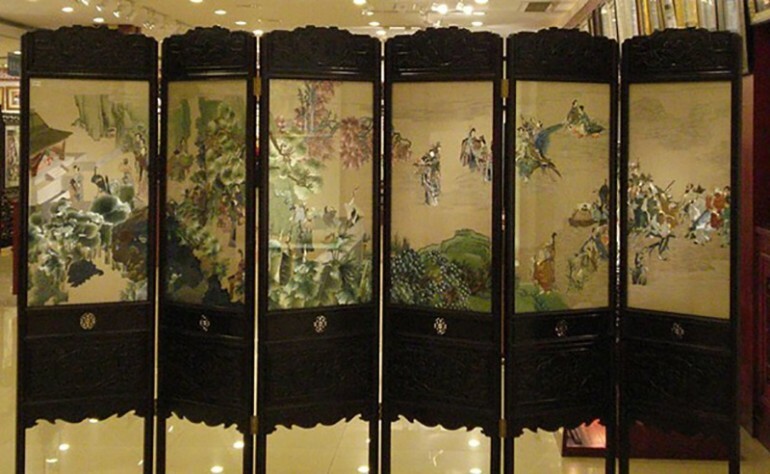 Considered as the best is the embroidery from Suzhou City which is called Su Embroidery. The city itself is known for its beauty and culture. Its many canals gave it the nickname “Venice of the Orient” and it had been praised for its bridges shaped like delicate bows, its ancient architecture and its classic and elegant gardens. But the city’s primary claim to fame it the silk embroidery that it produces. 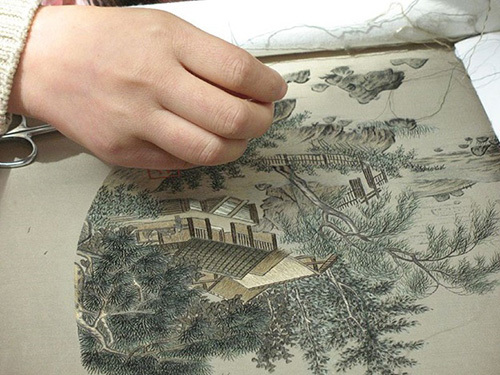 Today there still exist three schools that are very influential in the production of exquisite Su embroidery. One school uses the traditional style of even embroidery, which do not show overlapping threads. Another school specializes in emulation or realistic method that was established in early 20th century by Shen Shou, while random stitch work is the specialty of the third school. Each style is unique and is a captivating visual presentation. In silk embroidery just like in the Chinese classical art, most of the subjects and motifs focus on old Chinese paintings, flowers, peacock, fish and other animals, most of which are rooted in folk symbolisms. An orchid is a symbol of virtue and beauty while a tiger is believed to be a protector of humans against the Evil Eye. Artisans, after encountering Western art, have been inspired by portraits in oil, and have started creating the same genre, which is highly praised and is the most difficult style to be translated into Suzhou embroidery technique. Su embroidery requires the use of only the finest natural silk embroidery thread. Its octonary (eight-sided) construction allows the thread to refract light thus the thread colors become more vivid. The form and solidity of the silk allow the thread paintings to have over 1,500 tints. Following the traditional method, the silk threads are hand-dyed, with master dyers dividing the silk threads according to their thicknesses and how many sides each strand possesses. What is more impressive is that skilled embroiderers show no reverse side to the piece, as they are able to hide the knots skillfully. But unlike paintings, Su thread paintings are placed on horizontal frames where viewers are able to admire them from every angle. Double-sided embroidery is the epitome of Su embroidery. This is a very complex method that used silk cloth that is almost transparent. No knots are used in this method. Instead the ends of the threads are woven into the work in two layers. Short stitches are used to hide the ends and then longer stitches are used to hide the short stitches. Su embroidery have three styles of double-sided work. One style shows the same image on both sides while the second style shows the exact image on one side but in different colors. The most intricate style of Su double-sided embroidery shows a different subject and different color palette. Their mastery is skillfully displayed in such a way that the size and shapes of the figures on each side are perfectly matched so that the threads used on one side are hidden under the other image. Su embroidery evolved for more than 2,500 years. From 10 basic stitches, it had developed over 40 stitches, including random and even embroidery techniques. Even embroidery involves uniformity in stitching without any overlapping, which branched into neat stitching (qizhen) that required smooth thread lines of the same length, even when stitches are oblique, horizontal or vertical. They also developed gradient stitch (qiangzhen) for butterflies and flowers and layer stitch (taozhen) for bird feathers, animal tails and flower petals that required higher detailing. Souezhen or prodding stitch is freer and used so that photorealism could be achieved when embroidering birds and flowers while shizhen or thickening stitch is used for rolling clouds and animal fur. Another thing that distinguishes Su embroidery is the use of silk threads of varying thicknesses. Silk threads are already fine like human hair but the embroiderers of Su still split the strands into thinner threads – into halves, quarters, eighths, sixteenths and so forth. The finer the thread the more delicate the embroidery will be, but it does require greater mastery and precise handling. Jinzhen Gu, a Suzhou embroidery master has been singled out for her ability to split a strand of silk into 96 threads so fine in just three minutes. She earned an entry into the Guinness Book of Records because of her exemplary skill. The varying thicknesses allow the embroiderer to capture the delicacy of certain features of their subject. For example, very fine threads are used to showcase the swift dexterity of a goldfish tail while thicker threads are used for its body. Su embroidery involves several processes, from the selection of subject, then deciding on the fabric and style of the work up to thread color selection. Only after all the pre-processes have been done will the support fabric be stretched on the frame and work will begin. Su embroidery requires painstaking labor that is a mix of fine needlework, graphic art and delicate painting that results in a masterpiece that is full of contemplation and vivacious energy.